The Truth exudes infinite wisdom down to varied mountain paths in diverse abstractions. The quest of human minds while climbing up followed The Truth's distinct inspirations. Hindus experienced Truth's spirituality and philosophy and created voluminous traditions. Buddha grounded a spark of enlightenment to teach to end suffering by self-salvation. But, Amitabha was illuminated and developed a Dharma of relying on external-salvation. Tao discovered source and force behind the harmony of life with Yin and Yang formation. Muhammad searched through Abraham's prism and created Islam's austere theorization. The Son descended to cleanse the world by His blood as a sacrificial lamb of redemption. Yet, some persistently resort to the belief of nature's accidental evolution and random selection. Yet, the world sometimes gladly suffers fools who only pursue shallow sensory gratification. Ethical values have been devised into cultures to govern societies, hence evolving civilizations. Philosophers try to comprehend the incomprehensible only resulting in unproven conception. Yet, The Truth's metamorphosis entered the world to testify Truth's essence with affirmation. Truth's grace and love allow humanity the free-will to reciprocate love in utmost expression. Immature human consciousness rebelled against Truth's benevolence with betrayal actions. 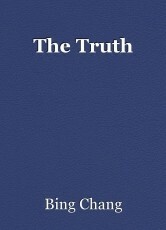 Truth's revelation was imbued with a triangular architectural principle of the trinity assertion. Human-invented religiosity attempts wisdom and proclamation, but is always void of perfection. Truth has been leading humanity by unveiling divine covenants during the course of maturation. Misinterpretation and mishearing inflict agonies, torments and darkness in human tribulation. Truth is Truth. Its supremacy: all-embracing. Its blessing: never-ending, an absolute benediction. May Interfaith dialogue and Vatican's ecumenism raise human minds toward Truth in culmination! © Copyright 2019 Bing Chang. All rights reserved.